I’m a fairly optimistic person, but it can be difficult at times to keep a glass-is-half-full mentality when the majority of the news these days is mainly negativity or viral Internet stories. There are some well-educated people out there making the case that economic growth in the future won’t be able to keep up with the averages we’ve become accustomed to in the past. This could lead to much lower returns in the financial markets and a decreased standard of living. Wealth inequality continues to widen the gap between the haves and have-nots, creating even more ammunition for the coming disaster. It’s easy to get sucked into this line of thinking because usually the PhDs presenting the case have complex models and a narrative to back up their claims. In an uncertain future, sometimes it’s easy to default to a pessimistic view on where things are heading. What if people are underestimating the potential of future worldwide economic growth and innovation. 1. We got smarter and faster at fighting polio. 2. Child mortality went down—again. 3. The poverty rate went down—again. 4. Rich countries re-committed to saving lives. 5. There’s less racism, sexism, and other forms of discrimination in the world. In the book Abundance: The Future is Better Than You Think, author Peter Diamandis makes the argument that we are underestimating the potential for future progress to solve the world’s biggest problems. According to the United Nations, poverty was reduced more in the past fifty years than in the previous five hundred. A week’s worth of the New York Times contains more information than the average seventeenth century citizen encountered in a lifetime. Anyone who has a smart phone has better mobile phone capabilities than the president of the U.S. did 25 years ago and better access to information than the president did 15 years ago (think Google). It’s impossible to predict what can happen when exponential growth takes hold because it means improvements build on themselves much like compound interest on steroids. 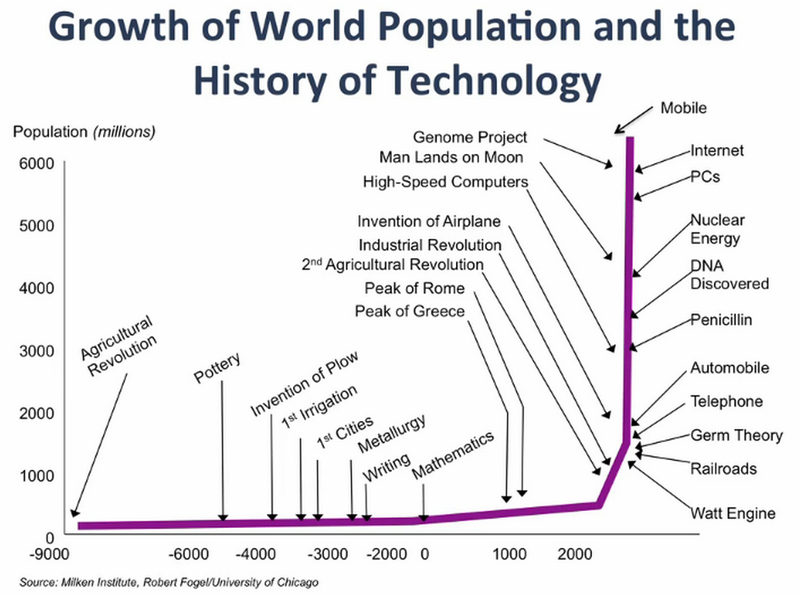 Diamandis argues that most people can’t even begin to imagine where the continued technological progress will take us because it’s hard to wrap your head around exponential growth. And not in some distant future hundreds of years from now. Back to the Future II could be here sooner than we think. The benefits from areas such as improved education could also lead to increased freedom and democracy in oppressive countries, although this one could take some time. What are the implications for you and your wealth? It’s hard to tell right now whether all of these predictions from Diamondis will work out. But if even a fraction of what he is forecasting comes to pass, this could mean (1) higher standards of living around the globe, (2) a rising middle class of consumers to purchase products, save and invest, and (3) technologies coming to light that were once only reserved for the movies. Not to mention the fact that many of these breakthroughs could help bridge the wealth gap and bring billions of people out of poverty (Many see a situation where the rich continue to get richer off of the technological progress but Diamondis makes the case that it will actually have a much greater impact on the poor than the rich). There could be new industries, sectors and companies to invest in and higher global economic growth with a new class of consumers on board to buy goods and service. It’s easy to fall into the trap of assuming everything is terrible in the world. Reading this book made me realize how great we have it now and how amazing life could potentially be in the future. We are not without problems in the world right now. Things could get worse before they get better. The point is that no one has any idea about the shape of the future especially when it comes to forecasting economic and technological developments. I choose to believe that people will continue to want to better their lives, innovate, get smarter, help others and keep the growth engine moving in the right direction. No actionable investment moves from this information…just something to consider. 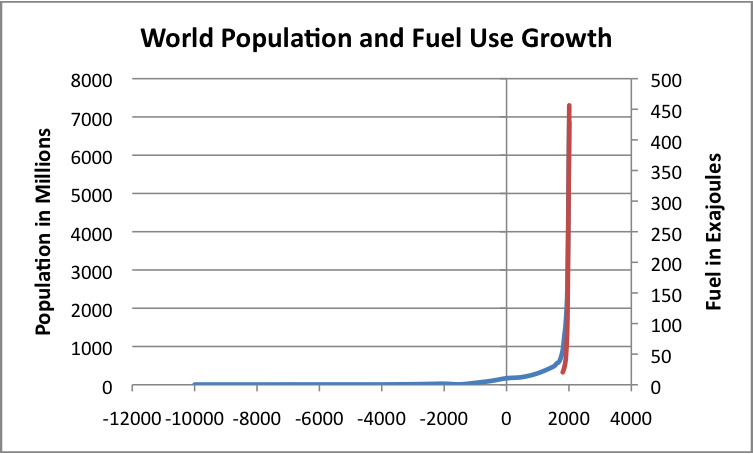 May I suggest to the blogger that he superimpose the graph of the explosion of the human population with that of the explosion in the use of fossil fuels. Solid rebuttal. The thing is if these technological breakthroughs come to fruition (a big IF), then the use of fossils fuels will actually decrease. I think driverless cars, electric cars and solar could be the game-changers here. And there is a negative correlation between increased levels of education & healthcare and birth rates. This could potentially keep population and fossil fuel issues under wraps. But, I agree, both are issues to consider. So many people are always looking for what’s going to go wrong in the future rather than the amazing things that are going to happen. It reminds me of Louis CK’s “Everything’s Amazing and Nobody’s Happy” stand up routine. If you’ve never seen it check it out. The future is a complete unknown but it always seems like we get better and better as a whole. People are living longer, less infants are dying each year as a %, more people have access to water/food. The future is still bright when it comes to improving the lives of many, and while it might not mean the same kind of economic growth, the impact on the human condition as a whole will continue to get better. I actually thought about including a line about that Louis CK routine. I included it in my latest monthly newsletter too. My wife and I saw him live last year. Great show. It does seem easier for people to find negativity everywhere these days. I see no reason to be skeptical about the future. We always have issues but things tend to get better over time.